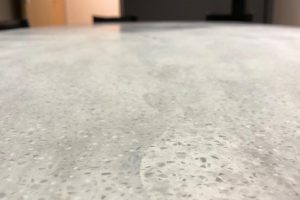 The veined aesthetics of solid surface have random and complex patterns that will allow you to offer completely unique design potential to your project. While veined colours give a stunning and unique finish, and are of course covered by the 10 year warranty, it is important to understand the finish these colours will give. The following information will enable you to make an informed decision to the suitability of your chosen colour for your project. 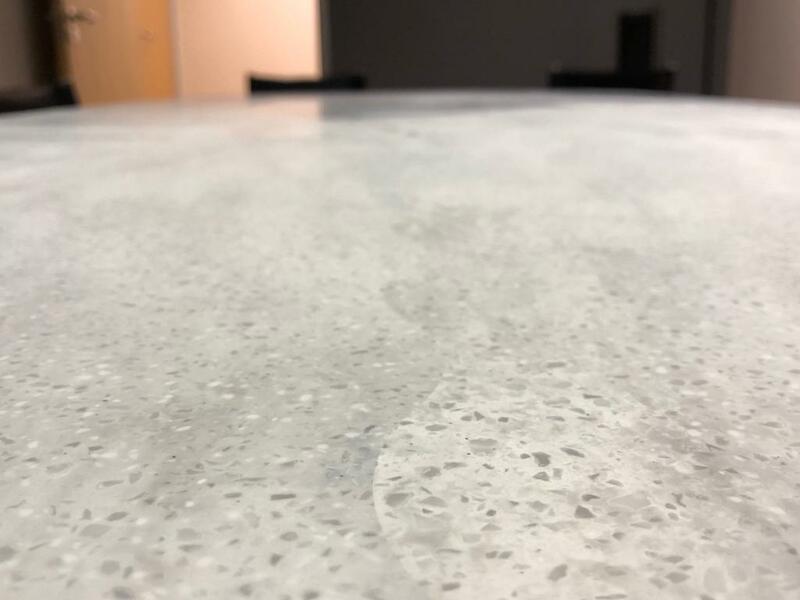 One of the primary reasons why people design using solid surface is its ability to be ‘seamlessly joined’ creating a beautiful single piece of material without the need for unsightly silicon joins, typical of Quartz/Granite etc. In order to achieve this look, especially when the project has sections longer than a single sheet (3.5M approx), there will be the need for joining of that material on site to occur. These are called ‘site joins’. When you are designing in a long run using a veined colour, there will often be the need to be extra consideration given for how the top is fabricated and where the joins are located, to ensure that the desired final look is achieved. Site joins are needed for practical reasons where either lifting or fitting of the top becomes impossible if made in one piece. We CAN’T do site joins in the corners where there are mitred joins. Where this join occurs, there will be a visual break in the pattern where a site join needs to be created. The direction of the veining will in most instances run the length of the worktops, not the depth, and when changing direction will have whats known as a mitered “L” corner (see picture below). This join will be a straight line where the pattern changes direction, similar to that of say a picture frame. Where site conditions dictate the size of the worktops being fitted (e.g. tight stairs or limited lift access) there can sometimes be the need for additional site joins (see above) and this can mean occasionally, although seamless, joins are visible at these junctions. See the photos below for an example of of how this joins may look. As you can tell from the examples, how noticeable these joins are often comes down to the colour, where some are almost invisible, and some have a more pronounced ‘mitre’. Worktops with a depth/width (depending on your aspect) greater than 760 mm will need to have a join along the length. The reason for this is that most solid surface comes in certain widths of material (usually 760 mm). With veined colours, this join will usually be done with whats called a ‘serpentine join’, shown in the image below. As with all joins, it will be seamless, but not invisible. Depending on the colour, this join may be seen, although the serpentine join allows for the typical veining to be more random and thus hides the seamless join. This will not necessarily be in the center of the top as shown in this example. See the images giving some examples. Cutting in to the depth of the sheet. Cutting into the sheet will reveal a different pattern and sometimes a shade shift, such as when drainer grooves/areas are applied. Please see the photo below to see and example of how this might look. The effect of this depends on the colour chosen. draws the eye to the cove and this can appear as a stripe. Below are some examples of where depending on the colour, coved up-stands can be more or less noticeable. On some of the more ‘veined’ colours such as White/Grey Onyx, another factor that needs to be considered is in the ‘shift’ of pattern when a site join may sit next to a corner mitred join. If there is veining that runs diagonally across, which is common in many of the veined colours, where the material cut by the sawing/CNC process is removed, sometimes you will get a obvious ‘shift’ in the pattern caused by the removed material when preparing the edges for joins. When our templaters are onsite, consideration will be given to this, but often this can be overlooked at the design stage and needs to be considered.